Fractal Design’s Ray Dream Studio 5 is a terrific professional level 3D modeling and animation package. It has features that I could not even begin to cover in this report. Therefore, this is a "first impressions" review. The illustrations that come with the package indicate unlimited possibilities for creativity. 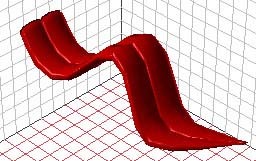 My limited journey into the Tutorial has shown the power of the software to create complex models with little effort. The most impressive thing you see when you open the box is the user’s manual, 418 pages of eye-popping results of the instructions on each page. The manual is repeated on the CD-ROM intact in Acrobat PDF format. The other impressive thing you find right away is the CD-ROM "jewel"box with cardboard front and back covers! Installation is a snap as you would expect on a Mac: double-clip the install icon; click on Install (the default); and when it’s finished, click on Quit and you’re done. 54 MB of hard drive space; and 32,224K allocated to RAM. The first chapter of the Users Manual covers installation. The next three give an overall view of the software. Chapter five is the tutorial where the fun begins. Twenty-seven lessons cover all the basic modeling and animation techniques. The first project is shown in Figure 1, a typical screen shot. The "Universe" is shown in the Perspective view in the upper left. This is an underwater scene that came intact on the CD to awe the beginner. The objects include a school of fish swimming among the seaweeds, a shell, a large fish, and under that fish is an anemone bed which is seen boxed, i.e. selected. Because it is selected, its properties are seen in the upper right. The lower right contains the Browser where Objects, Shaders, Deformers, etc. Are selected for use in a project. The Time Line is seen in the lower left. Each item in the Universe has a time line to control its progress through the animation. After finishing the first project, I scanned through the whole rest of the manual. For a person starting in animation with Ray Dream, the manual will probably look quite daunting. For me everything looked familiar or at least easy to understand on the basis of my having worked with Macromedia’s Swivel 3D Pro for several years. I had great fun and experience with 3D Pro but it does not have nearly the capability of Ray Dream Studio 5. 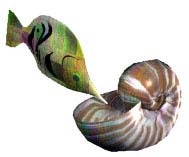 The main feature lacking in 3D Pro that made me graduate to Ray Dream is the ability to change an object’s shape during the animation. 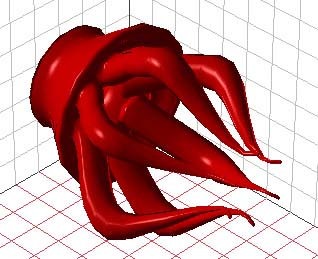 Articulating object parts, such as arms and legs as I did with 3D Pro, is not changing shape. A few illustrations illuminate my brief foray into the Tutorial. Figure 2 is a piece of seaweed that was made with a simple cross section, an extrusion, and a couple of bends and pokes to curve it. Another version of the seaweed with different curves served as a second "keyframe" in an animation. The application of a sinusoidal Oscillation made the seaweed appear to be waving in the water stream. Simple! Figure 3 shows an anemone that was incredibly easy to make. Even with my stumbling along, I did this in one sitting. Almost everything was done by bending pieces. All the surfaces are smooth curves. On my old software I would have had to make a large number of cross sections for each leg and then cover them. There would be sharp edges at each section. And it would have taken me a week to make it. Figure 4 shows a fish that came canned (if you’ll forgive the expression) on the CD. 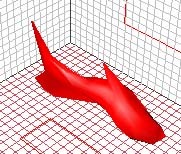 The application of a little curve bending and vertex pulling brought the fish to the more naturalistic pose in the figure. A second picture with a differently curved pose plus the sinusoidal Oscillation had the fish swimming through the water. Figure 5 illustrates the use of Shaders that put surface features on objects and the use of Lights. The original figure is gorgeous in color. I hope the Journal monochrome version doesn’t lose the effect. The first lessons in animation taught how to control an object’s speed and apply physical effects such as impact and flow force in an underwater scene. 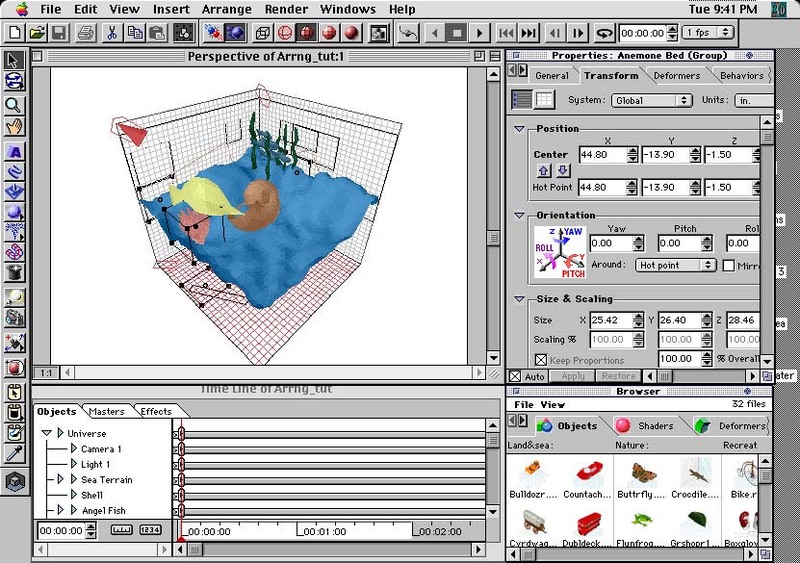 The previous software package had no physical effects and the preview animation was shown only in box outline. In Ray Dream the preview animation shows all the objects in the preview (simplest) shading. In Ray Dream each object can have its own keyframes. In the previous software package each keyframe was shared by all objects. Several times during the course of the Tutorial, I got stuck. In every case a contact to Fractal Design’s technical support Web page solved the problem. The request for help is done on a detailed form that informs Fractal of all the details of your system, including the serial number of the software, before it asks what the problem is. After the request is submitted, a note says that an answer will be forthcoming within two working days. In every case my answer came back in less than 24 hours. This is a great software package with great potential. I’m just beginning to get my feet wet with it. When I’ve created some models of my own, animated them in a "meaningful" way with appropriate sound, and created a QuickTime movie, I’ll feel that I’ve accomplished something. For the serious animator Fractal Design’s Ray Dream Studio 5 is certainly a valuable application and I recommend it. The CD-ROM includes: Installer; Tutorial; Users Manual; Extensions; a large collection of models, shaders, textures, cameras (with selectable lenses, including a zoom), lights, deformers, mechanical links (the human links folder is empty! ), behaviors, and render filters. The reference card shows: all the screen buttons of which there are dozens; the two modelers have their own sets of buttons; all the windows; and a very long list of keyboard shortcuts.